L. yapingense is an exceptionally rare, dwarf that is native to alpine areas of China. This lilium species is nomocharis-like in similarity. It is similar in appearance to L. nanum but differs from L. nanum in that L. yapingense has no spots on the tepal bases but instead has symmetric stripes. This photo, graciously provided by Alan Mitchell of Scotland taken in the Yunnan in 2014. Title photo copyright Alan Mitchell, all rights reserved. Used with permission. Photo inserts taken in natural habitat by Bjornar Olsen of Norway. Coypright Bjornar Olsen, Chinese Alpines, at http://www.chinesealpines.com. All rights reserved. Source location internet postings. 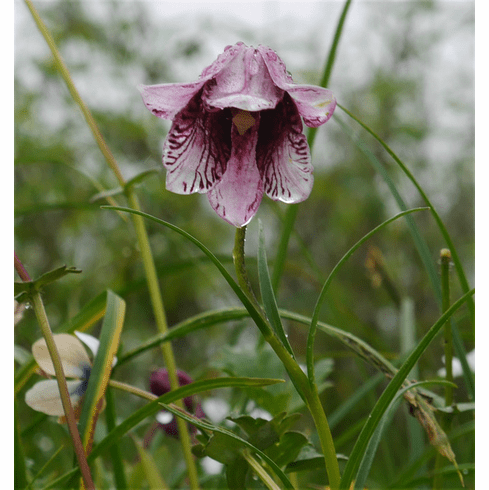 'Chinese Alpines' found at http://www.chinesealpines.com offers a great selection of rare Chinese Species. Insert #2 is from a posting to the Scottish Rock Garden Club by Mr. Olsen showing the rich raspberry red this lily can exhibit as part of its color range in nature.